Welcome! 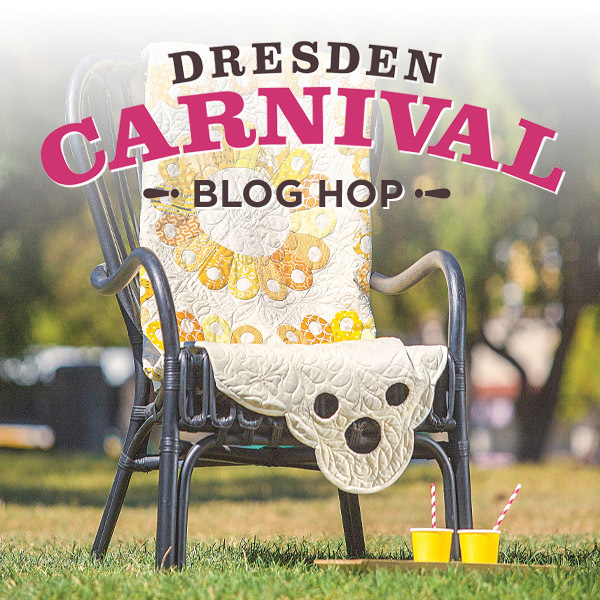 Today is my stop on the Dresden Carnival Blog Hop. The book was written by a mother and daughter, Marian Gallian and Yvette Marie Jones. I will admit that I have never made a dresden quilt because I thought it was kind of intimidating, but this book is really making me want to give it a go. I was immediately drawn to this Lily Pad project. I love how much movement the quilt has. And then in this alternate colorway. I would have never guessed that this quilt was based on the Dresden plate. The dresdens are appliquéd, which is a little scary for me, but I think I am going to have to try it anyway. And how gorgeous is this? I love the floating petals. 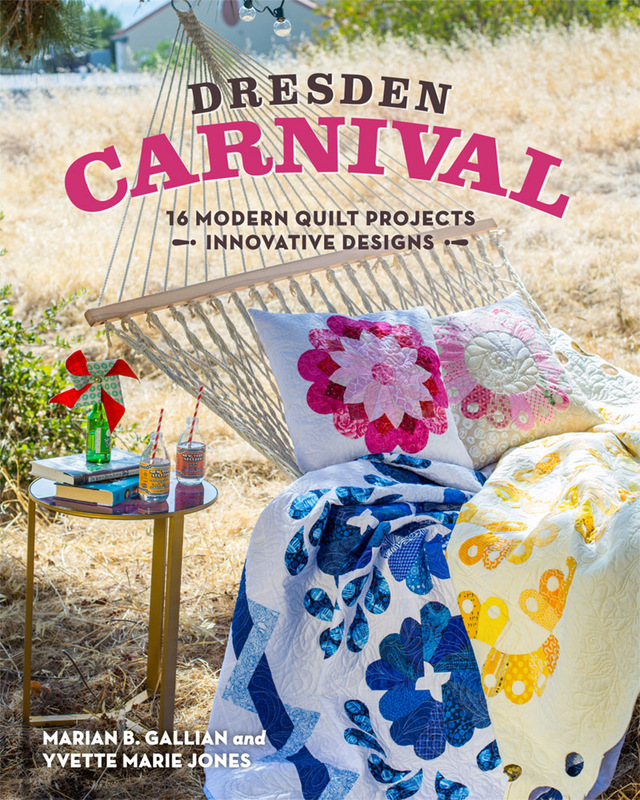 I think that this is a great book for people who love Dresden quilts, but it is also a great quilt for people like me to who would like to branch out a little bit and try something new. And there is a giveaway! Stash is giving away a copy of the book to one lucky winner. To enter to win, just leave a comment on this post. I will choose a winner on April 29th. This is the first blog hop that I've participated in. But I'm loving seeing everyone's perspective about the Dresden quilts. I've never made Dresdan quilt but have always loved their vintage look. It's so interesting to see it take a modern spin! This looks like a lovely book to own. I have always wanted to make a Dresdan quilt and this book is a must have, hope to win. I'm loving the petal quilt! It would be so awesome to win this book. Such beautiful quilts. Dresden quilts are so beautiful! Thanks for the chance to win! I never dared my hand at dresdens either, but I love love love the look of the quilts that you show so I definitely want to give it a try! Thank you for the chance to win. The book sounds very interesting and I would love to have a copy! Thanks for this opportunity! Such beautiful quilts inspire me to have a go at making one! I love dresdens! 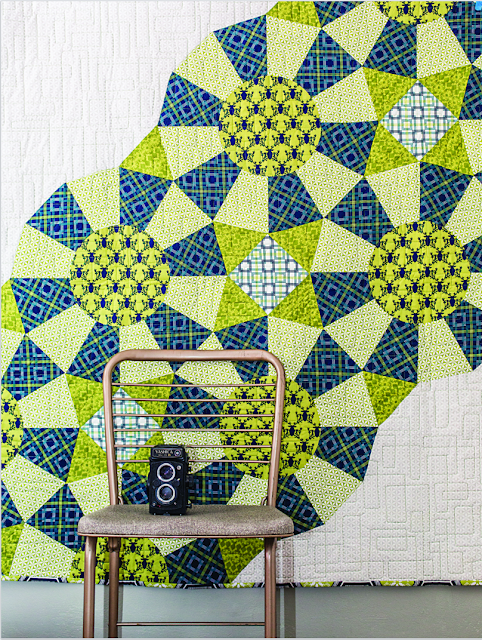 That lily pad quilt is stunning - the navy and lime is just gorgeous! Dresdens are a lot easier than they look and the sense of accomplishment you get is super rewarding. Thanks for introducing this fabulous book on dresdens. I've certainly seen more options than I had every considered. I need this! I have cut a Dresden quilt, but have been searching for a creative way to put it together. I'm esp interested in the cover photo with the inset circles -- wow! Maybe Dresden Plate is something for me to try, too! Thank you for the opportunity to win! Great inspiration! Thank you for the giveaway! I need to buy a Dresden ruler and try it out. Gorgeous! I haven't tried this pattern yet, but these look like a lot of fun, summer projects. Oh Wow! I love Dresden Plate blocks and especially am drawn to the free falling leaves design. Thank you for the opportunity to win this awesome book. The book looks great and love these quilts.I love dresden quilts but haven´t done any quilt only blocks for samplers or cushions.Thanks for the chance. You are right, they really brought the Dressden plate pattern into a whole new level of awesomeness ! Great photography too. I love the same quilt! I would be trying that one first!! Looks like a lovely book. Love the modern look at Dresden plates! 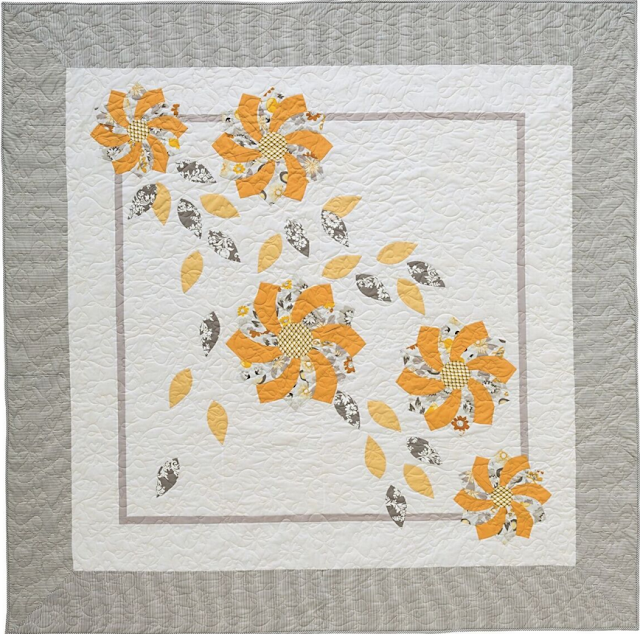 I love the floating petals in the yellow and grey Dresden quilt. I made the Xmas Wreath from EBs book book - that was a single Dresden in red and greens. What a difference updating the Dresden block makes...such fresh quilts, who would have thought? Thanks for sharing the giveaway! Looks like a great book! A dresden quilt has been on my quilty bucket list for ages. Looks like such cute pillows on the cover. Have never made a Dresden but have always admired the pattern. Love Dresden plates! And these look so unique and would be fun to make. Thanks for sharing this with us. This looks like a great book! Love that lily pad quilt! I've made a Dresden quilt but really love the non traditional look of the projects you highlighted. Those are certainly beautiful projects. Thanks for a chance to win. My grandmother made me a quilt loooong ago when I was 5 or 6--I still have it, a Dresden quilt. It is tattered and worn, mended and loved--it is made of old clothing and sewing scraps. Remind me to show it to you some day. I would love to learn how to do dresden quilts, this looks like an amazing book. I have not tried a Dresden plate quilt before, but it is on my list of quilts I would love to try someday. That Lily Pad quilt looks so cool-I think I will have to add that one to my list as well!! ;) Thanks for a chance to win! I love this block and I really like the modern version shown in this book. Thanks for the chance to win. Even though I have 2 Dresden Plate templates, I have not used them because I, too, have been intimidated by them. I need to dig them out of the closet and get busy! These quilts are gorgeous! The more I see of this book, the more I like it! I would love to win a copy! I have a Ruler..haven't tried yet tho... Planning to give it a shot this Summer tho.. Loooove Dresdens! I have always wanted to make a Dresden quilt so it is on my bucket list. Thanks for the great giveaway. Love the quilt on the cover!! The featured quilt on the book cover is so adorable as is the Floating Petal quilt. Love the creative ideas for Dresden quilts. I've put half dresdens on mug rugs & zipper pouches. It's time to feature some in a quilt I think. I've never made a Dresden Plate - but now I'm dying to try one! One of the (many!) things on my bucket list is at least one quilt in the lovely Dresden plate design. I had no idea there were so many possibilities - I'd love to win this beautiful book! I'm getting excited about Dresdens again. So many great quilts in here. This has been a fun blog hop. I'm loving all the different variations on the Dresden Plate. Looks like a fabulous book. I am always amazed when someone finds a creative new approach to a traditional block. The Dresden plates look so fresh and modern. Love the colors too. gorgeous. I have yet to try dresdens. Thanks for a chance. Lilypads it is!. I've been ogling over Dresdens for too long...time to step outside my box and try it. Thank you. I love classic dresden quilts, and all of the interpretations I've seen from this book are so lovely! I like that you mention this book is good for those wanting to branch out and try something new- that's exactly what I've been wanting to do! Dresden plates are simply beautiful! Love these! I need this book in my life. My IG and blog handles are, after all, Dresden Lane. I love the yellow cover quilt. Very interesting! I love Dresden quilts and the first picture is my favorite. I would love to make it. Thanks for the chance to win this book. Si many beautiful quilts! Who knew there were so many different layouts and designs using the dresden. I would love to try the flower petals. Beautiful. It's amazing to see so many different settings for Dresden's--very inspiring since I have a box of them that were gifted to me last year! Oh, hot damn! These are fabulous - I've only ever made one Dresden Plate table topper, and now I'm seriously inspired - these look so cheery! Thx for the giveaway! I would love to win this and try a new technique. These are gorgeous!! Love the one with the leaves throughout the swirling plates. They look more like flowers. Love dresdens!! Thanks for the opportunity to win! Those dresden plate pillows on the front cover of the book are fantastic! Thanks for blog hop and chance to win. This book looks like my kind of quilt book ~ I love dresdens!! I hope I win this ook - would love to try to make circular quilts. Love Dresden plate patterns! I have made a couple of cushions over the years, but would love to make a whole quilt! I have never done a Dresden before. I love these projects. Thanks for hosting the drawing. I love Dresdens!!! The Lily Pad quilt is amazing!!! I loved the hop and the great projects! What fun quilts. The floating petals is my favorite!